IMAGE: Jeffrey Scherrer, Ph.D., is an associate professor in Family and Community Medicine at Saint Louis University. ST. LOUIS – Opioids may cause short-term improvement in mood, but long-term use imposes risk of new-onset depression, a Saint Louis University study shows. The study, "Prescription Opioid Duration, Dose, and Increased Risk of Depression in 3 Large Patient Populations," was published online Jan. 11 in the Annals of Family Medicine. 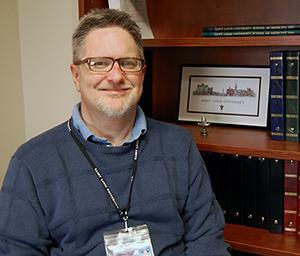 Jeffrey Scherrer, Ph.D., associate professor for family and community medicine at Saint Louis University, and his co-authors speculate that findings may be explained by long-term opioid use of more than 30 days leading to changes in neuroanatomy and low testosterone, among other possible biological explanations. The link was independent of the known contribution of pain to depression, and the study calls on clinicians to consider the contribution of opioid use when depressed mood develops in their patients. "Opioid-related new onset of depression is associated with longer duration of use but not dose," Scherrer wrote. "Patients and practitioners should be aware that opioid analgesic use of longer than 30 days imposes risk of new-onset depression." The study calls for additional research to identify which patients are most vulnerable to opioid-related depression. Scherrer and his co-authors collected patient data from 2000-2012 from the Veterans Health Administration (VHA), Baylor Scott & White Health (BSWH), and the Henry Ford Health System (HFHS). The data sets were comprised of 70,997 VHA patients, 13,777 BSWH patients and 22,981 patients from HFHS. The patients were new opioid users, ages 18 to 80, without a diagnosis of depression when they began taking medication. Whether results generalize to two independent health care populations. Twelve percent of the VHA sample, 9 percent of the BSWH sample and 11 percent of the HFHS sample experienced new-onset depression after opioid analgesic use. "Findings were remarkably consistent across the three health care systems even though the systems have very different patient characteristics and demographics," Scherrer said. In all three patient populations, longer duration of opioid analgesic use was associated with new-onset depression after controlling for pain and daily morphine equivalent doses. The authors note that research on the efficacy of opioids in depression treatment, while limited by small samples, short follow-up times and lack of control groups, does not support opioids as an effective long-term treatment for depression. Opioid drugs in the study included codeine, fentanyl, hydrocodone, hydromorphone, levorphanol, meperidine, oxycodone, oxymorphone, morphine and pentazocine. Other authors include Joanne Salas, MPH, of the Department of Family and Community Medicine at Saint Louis University and Harry S. Truman Veterans Administration Medical Center, Columbia, Mo. ; Laurel A. Copeland, Ph.D., Center for Applied Health Research, Baylor Scott and White Health, Central Texas Veterans Health Care System, Temple, Texas, Texas A&M Health Science Center, Bryan, Texas, and University of Texas Health Science Center, San Antonio, Texas; Eileen M. Stock, Ph.D., Center for Applied Health Research, Baylor Scott and White Health, Central Texas Veterans Health Care System, Temple, Texas, and Texas A&M Health Science Center, Bryan, Texas; Brian K. Ahmedani, Ph.D., Henry Ford Health System, Center for Health Policy and Health Services, Detroit, Mich.; Mark D. Sullivan, M.D., Department of Psychiatry and Behavioral Health, University of Washington School of Medicine, Seattle, Wash.; Thomas Burroughs, Ph.D., Saint Louis University Center for Outcomes Research, St. Louis, Mo. ; F. David Schneider, M.D., MSPH, Department of Family and Community Medicine, Saint Louis University, St. Louis, Mo. ; Kathleen K. Bucholz, Ph.D., Department of Psychiatry, Washington University School of Medicine, St. Louis, Mo. ; and Patrick J. Lustman, Ph.D., Department of Psychiatry, Washington University School of Medicine, St. Louis, Mo., and the Bell Street Clinic, VA St. Louis Health Care System – John Cochran Division, St. Louis, Mo. This study was supported by the National Institute of Mental Health, Prescription Opioid Analgesics and Risk of Depression, R21MH101389.